Karen Davis-Farage and Eyal Farage embarked on second careers in 2010 when they utilized their knowledge and experiences in building new and innovative businesses to construct and open an electric karting franchise in Jersey City. With Karen’s know-how in the software industry and Eyal’s skills in his construction company, the duo’s operation quickly grew to five locations throughout the Northeast. In July 2017, the company rebranded to its own proprietary concept and opened RPM Raceway to expand and provide new experiences to its racers. Scroll or click for more photos of RPM Raceway! RPM Raceway’s mission is to provide an authentic, exhilarating and memorable racing experience second only to climbing into an actual race car. Guests race in its fastest lap format on two quarter-mile European-style racetracks in high-performance, Italian-made electric go-karts capable of speeds up to 45 MPH. Since the karts use electric technology there are no fumes, providing a clean and green experience. As part of the rebrand, the company rolled out a modified pricing structure adding more value to returning racers and a new mobile app that provides an array of real-time information, while allowing racers to schedule and purchase races and gift cards. 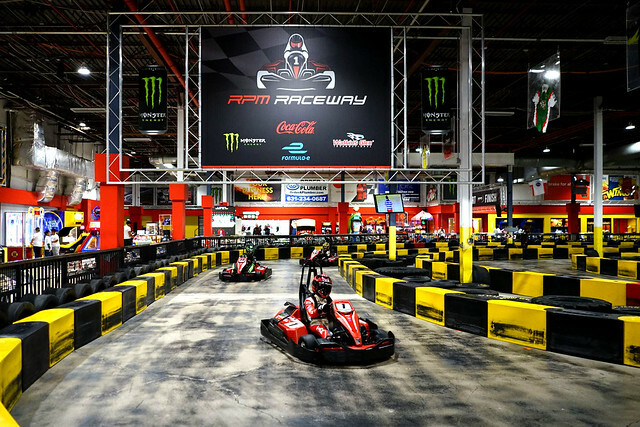 The brand is also expanding facilities in select locations by adding restaurant and bar operations as well as experiential entertainment activities, including its new racing attraction at the Jersey City facility: RPM SIM. This interactive, full-motion race car simulator serves as a top training choice of professional racers while allowing aspiring contenders to experience the feeling of driving an actual race car at top speeds through a variety of driving formats. Created for racers of all levels, RPM Raceway caters to both first-timers seeking a quick thrill to determined racers looking to advance their skills. The company does so by offering a variety of racing options including ‘arrive and drive’ racing, racing events with groups of eight or more, clinics and year-round racing leagues. RPM Raceway regularly hosts personal celebration parties as well as large corporate and teambuilding events in its event spaces and can accommodate facility buyouts. RPM Raceway is an exciting destination and strives to make all events memorable experiences that fit the unique needs of each group. After spending thirty-two years in the technology industry, Karen recognized RPM Raceway as the perfect venue for corporations to host corporate events and promoted it as such. “Team building is a vital element to incorporate into any business or organization as there are numerous benefits to both the employers and employees. Outings create bonding experiences that build trust among team members. It improves productivity by providing outlets for stress relief and socialization with colleagues, and often helps to develop better lines of communication by interacting in a relaxed environment. Teambuilding also increases job satisfaction and self-motivation when organizations show their appreciation and are genuinely interested in their employees’ happiness”, states Karen. Since the company’s inception, the business has grown steadily in all five market segments: Arrive and Drive, Personal Celebration, Corporate, Tourists and B2B2C markets. RPM Raceway takes the time to understand each groups’ objectives to host successful, fully-customized events by integrating racing with food, beverage, branding, and audio/visual elements. Hundreds of Fortune 1000 companies, regional chambers, convention & visitors bureaus and other associations regularly host get-togethers and networking events at RPM Raceway to encourage racers to test their skills in a competitive environment that they may thrive in. This model has helped the brand to increase and grow each year. RPM Raceway’s decision to rebrand better positions the company to deliver enhanced racing and entertainment experiences at its existing locations while working to expand into new markets. All of the new amenities, coupled with the top-of-the-line customer service that racers have come to expect, rounds out the RPM Raceway experience. For information, pricing, online race booking or hosting a personal or corporate event, visit www.RPMRaceway.com or call (201) 333-7223. RPM Raceway also can be found on Facebook, where fans can stay in the know with events and promotions and receive updates on new offerings and facility openings.